J. Mett Shippee shovel testing the Steed Kisker site in hopes of finding a Mississippian house. The photograph was taken by Michael Fisher and digitized by Michael Fuller. 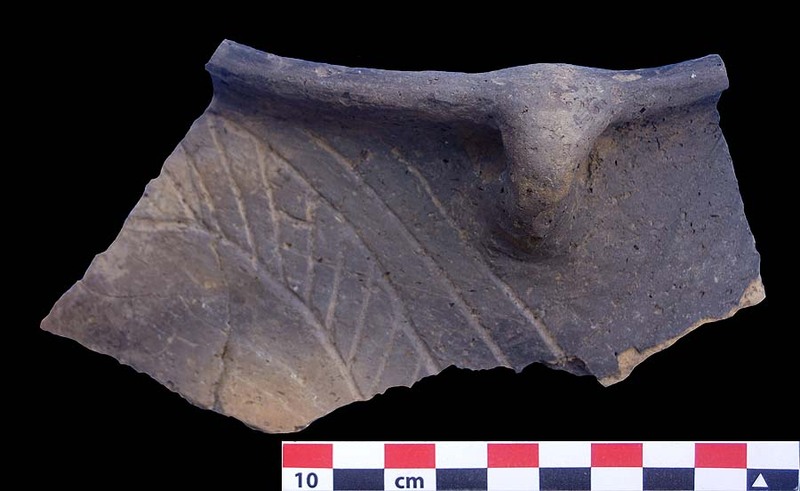 Rimsherd to an incised, shell tempered pottery vessel discovered by J. Mett Shippee in September of 1938. Body thickness ranges from 5.5 to 8.9 mm and rim thickness ranges from 10.9 to 11.4 mm. 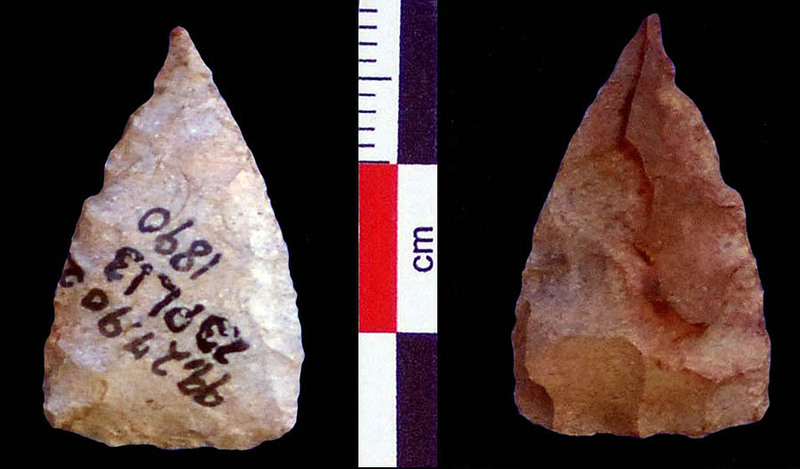 Cahokia point surface collected from the site by J. Mett Shippee and curated by the St. Joseph Museum. Length = 17.8 mm, width = 14.0 mm, thickness = 3.7 mmand weight = 0.7 grams. Madison point surface collected from the site by J. Mett Shippee and curated by the St. Joseph Museum. Length = 25.3 mm, width = 15.3 mm, thickness = 5.0 mm and weight = 1.6 grams. Preform surface collected from the site by J. Mett Shippee and curated by the St. Joseph Museum. Length = 41.8 mm, width = 27.1 mm, thickness = 6.1 mm and weight = 5.6 grams. 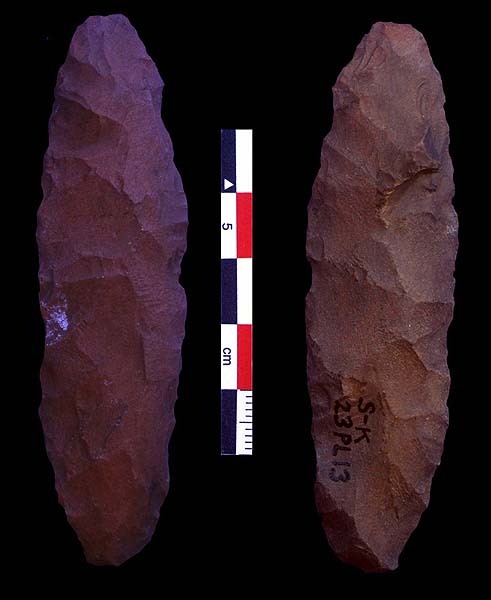 Unifacially flaked end scraper collected from the site by J. Mett Shippee and curated by the St. Joseph Museum. Length = 41.0 mm, width = 22.8 mm, thickness = 8.2 mm and weight = 8.3 grams. 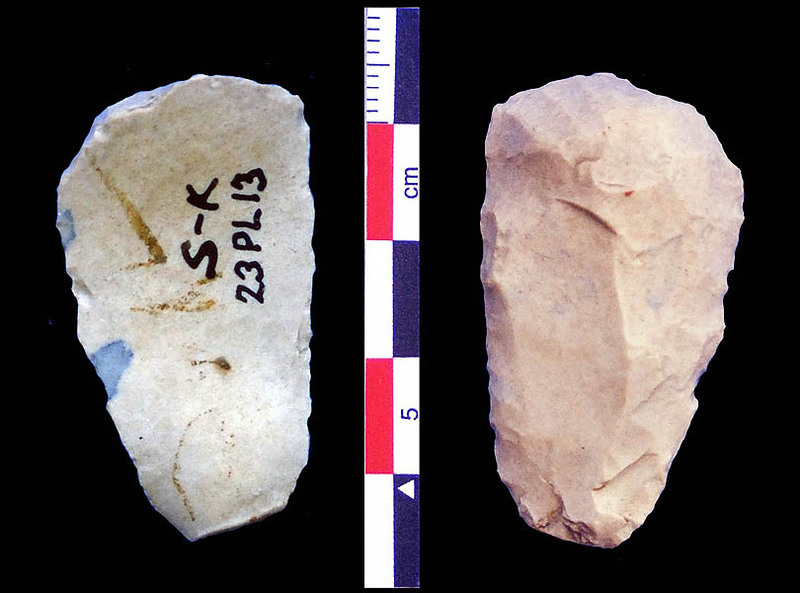 Unifacially flaked end scraper collected from the site by J. Mett Shippee and curated by the St. Joseph Museum. Length = 39.8 mm, width = 21.1 mm, thickness = 7.9 mm and weight = 7.5 grams. 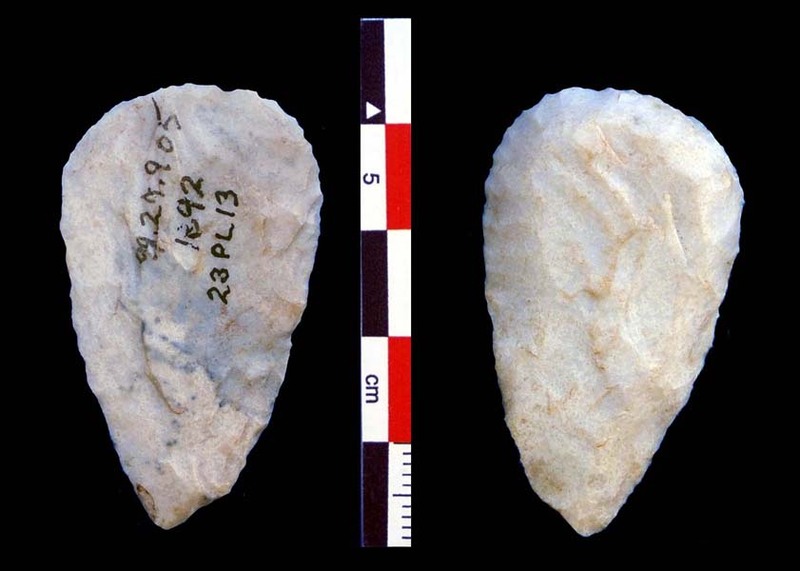 Unifacially flaked end scraper collected from the site by J. Mett Shippee and curated by the St. Joseph Museum. Length = 37.5 mm, width = 23.2 mm, thickness = 10.3 mm and weight = 9.0 grams. 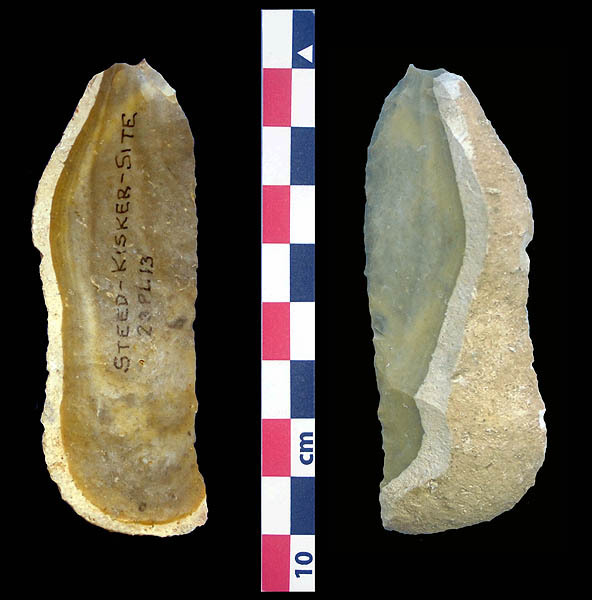 Flake knife (with original cortex) collected from the site by J. Mett Shippee and curated by the St. Joseph Museum. Length = 81.3 mm, width = 29.3 mm, thickness = 10.2 mm and weight = 24.2 grams. 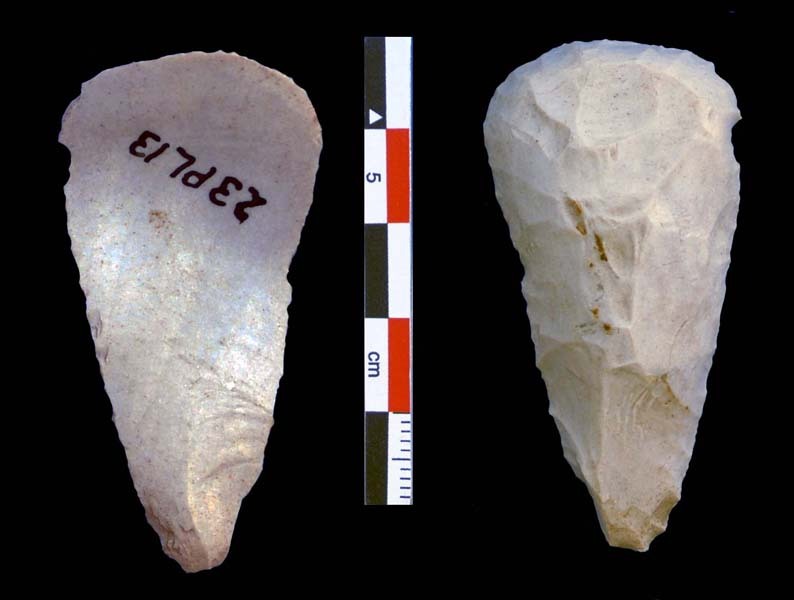 Unifacial scraper collected from the site by J. Mett Shippee and curated by the St. Joseph Museum. Length = 42.2 mm, width = 24.4 mm, thickness = 6.0 mm and weight = 7.5 grams. 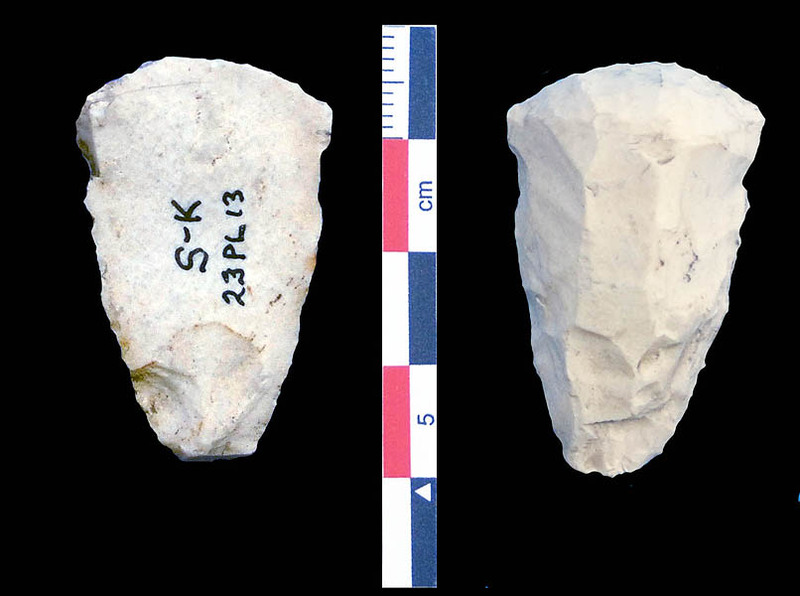 Unifacial scraper collected from the site by J. Mett Shippee and curated by the St. Joseph Museum. Length = 63.7 mm, width = 29.5 mm, thickness = 8.1 mm and weight = 18.0 grams. 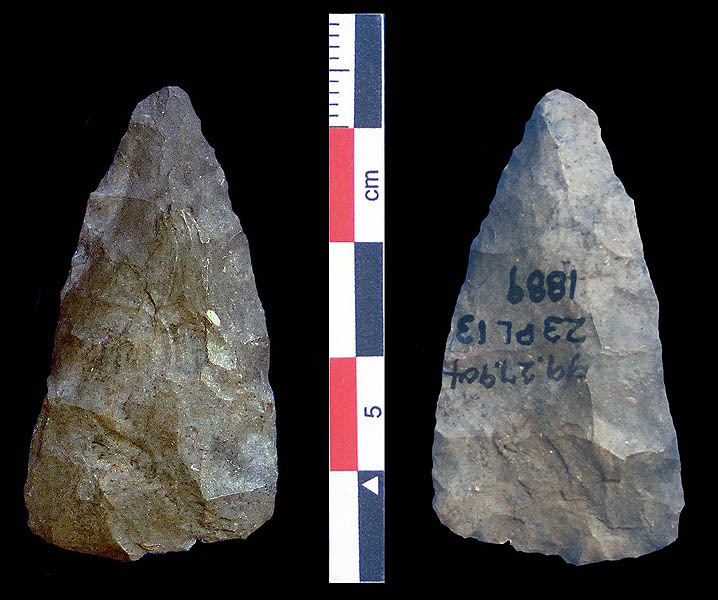 Un-notched biface, possibly a Nebo Hill point, collected from the site by J. Mett Shippee and curated by the St. Joseph Museum. Length = 83.3 mm, width = 23.3 mm, thickness = 9.7 mm and weight = 19.0 grams. 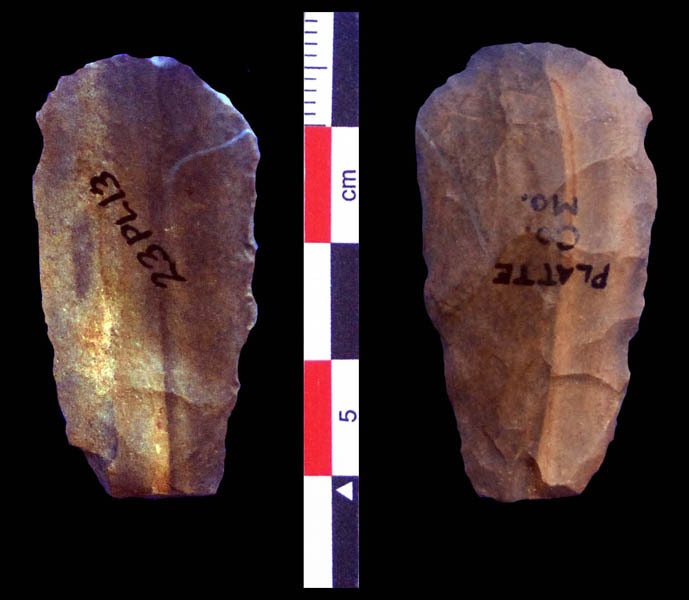 Unifacial flake knife collected from the site by J. Mett Shippee and curated by the St. Joseph Museum. Length = 78.4 mm, width = 28.8 mm, thickness = 7.4 mm and weight = 14.4 grams. 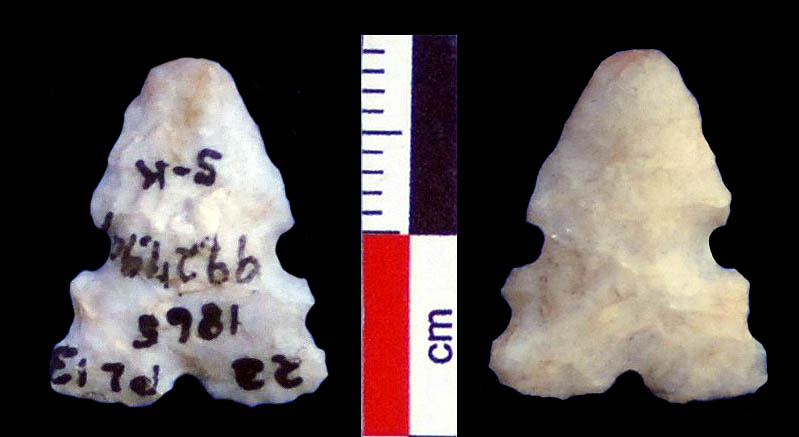 Preform collected from the site by J. Mett Shippee and curated by the St. Joseph Museum. Length = 49.8 mm, width = 28.1 mm, thickness = 6.3 mm and weight = 8.7 grams. Scraper collected from the site by J. Mett Shippee and curated by the St. Joseph Museum. Length = 37.1 mm, width = 24.8 mm, thickness = 6.1 mm and weight = 6.7 grams. Scraper collected from the site by J. Mett Shippee and curated by the St. Joseph Museum. Length = 54.3 mm, width = 27.3 mm, thickness = 8.7 mm and weight = 14.7 grams. 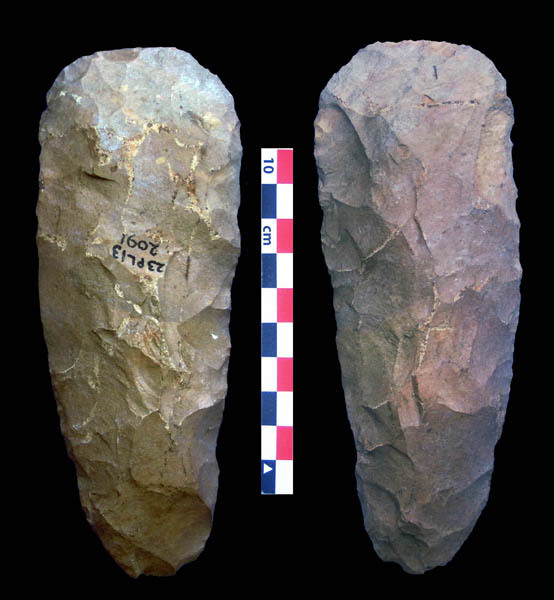 Agricultural tool (a spade) collected from the site by J. Mett Shippee and curated by the St. Joseph Museum. Length = 156.1 mm, width = 58.0 mm, thickness = 34.4 mm and weight = 200+ grams. 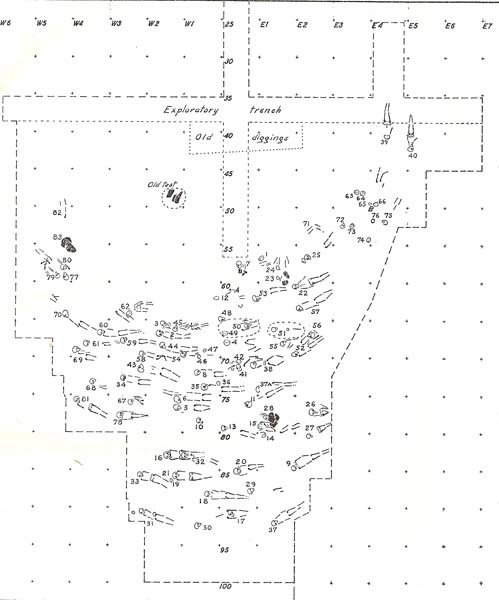 Waldo Wedel's map of the burials discovered at Steed Kisker. 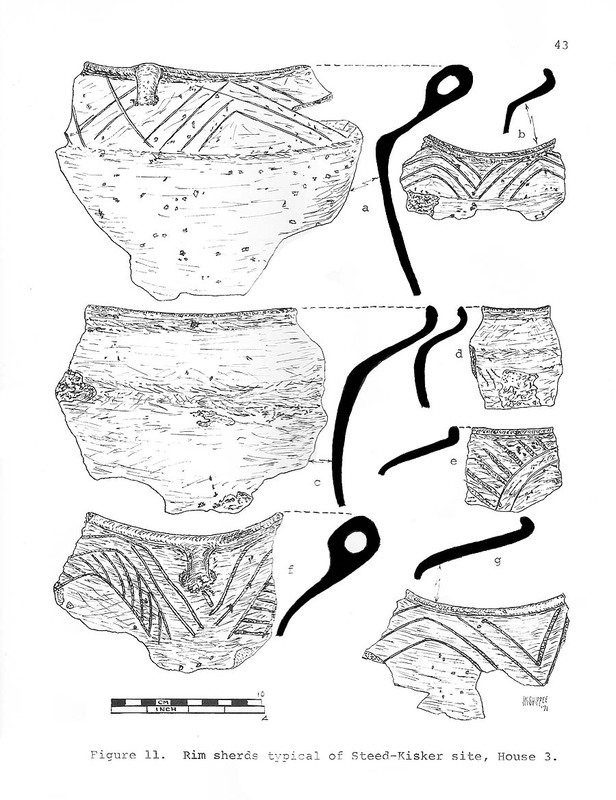 Pottery vessels from Steed Kisker site. 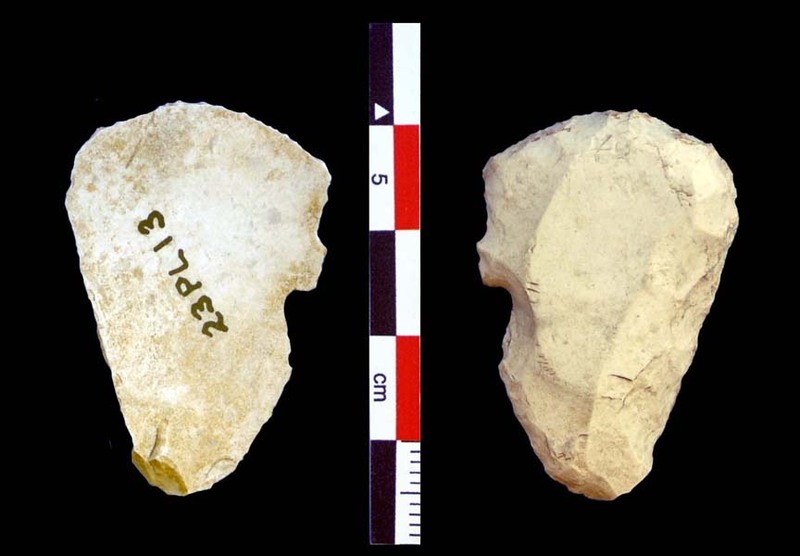 Pottery sherds and chipped stone tools from the Steed Kisker site. 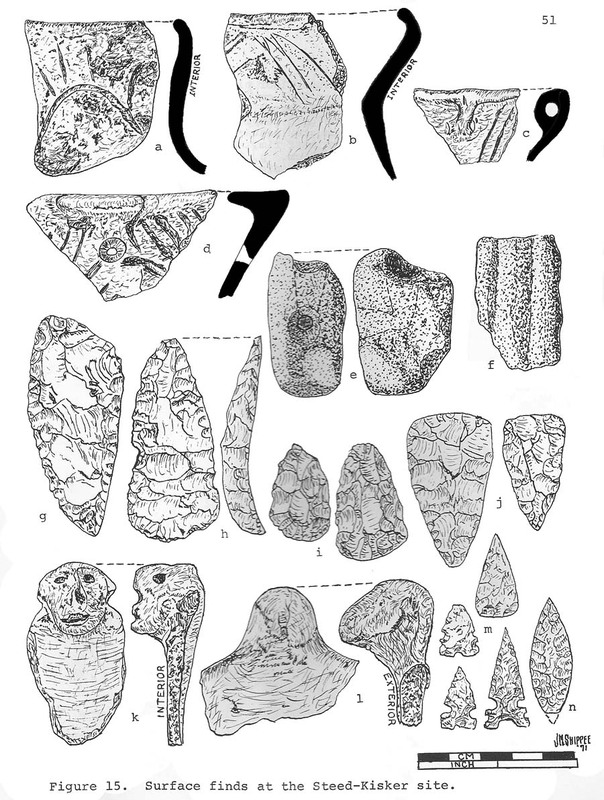 Rimsherds from House 3 at Steed Kisker site (Shippee 1972:Figure 11). 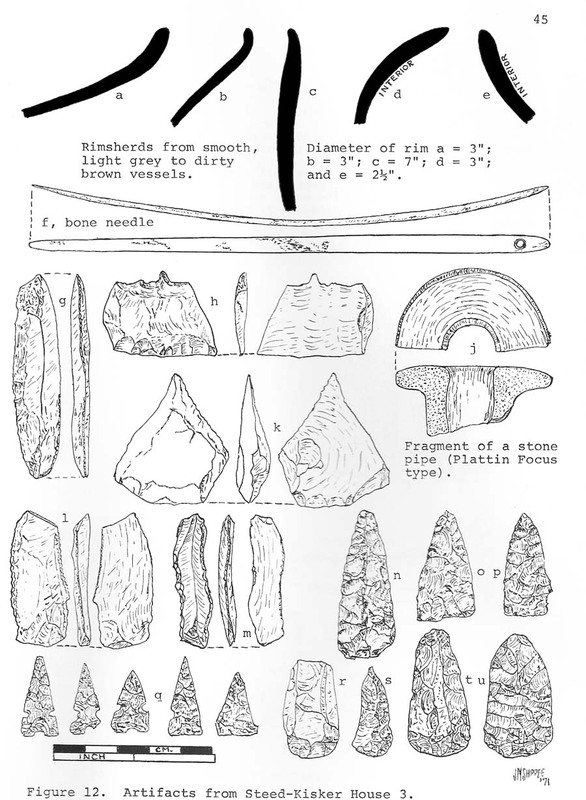 Bone needle and projectile points from House 3 at Steed Kisker site (Shippee 1972:Figure 12). 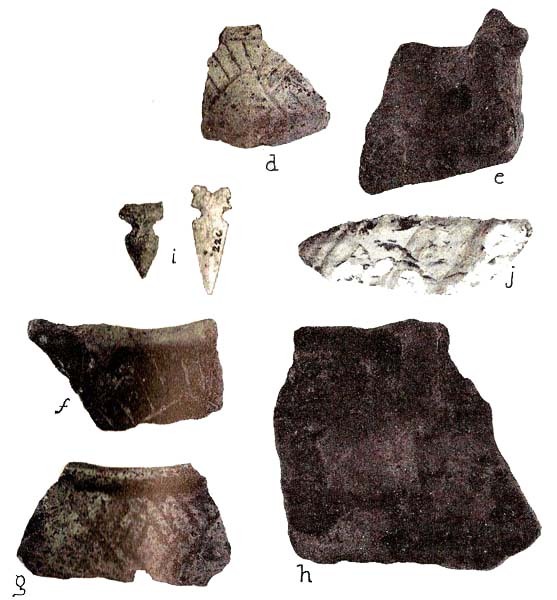 Artifacts from House 3 at Steed Kisker site (Shippee 1972: Figure 13). 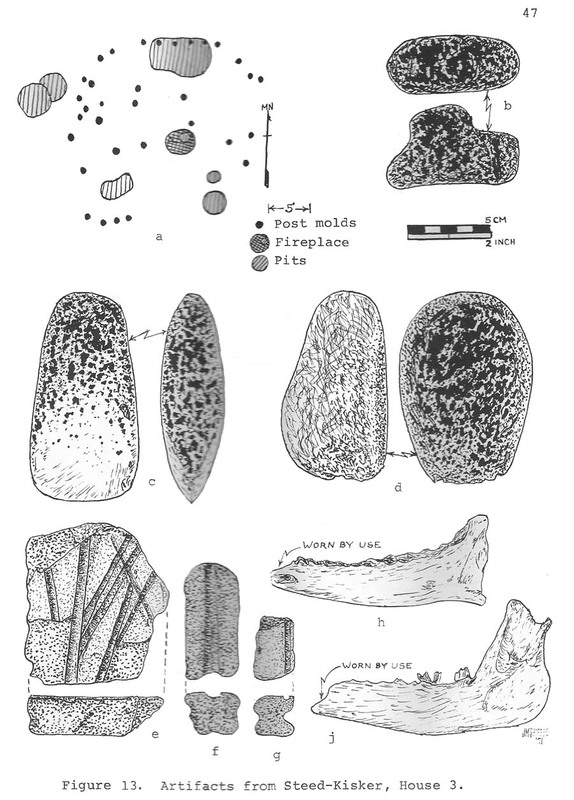 Surface finds from the Steed Kisker site (Shippee 1972: Figure 15). My copy of Mett's report with his autograph. 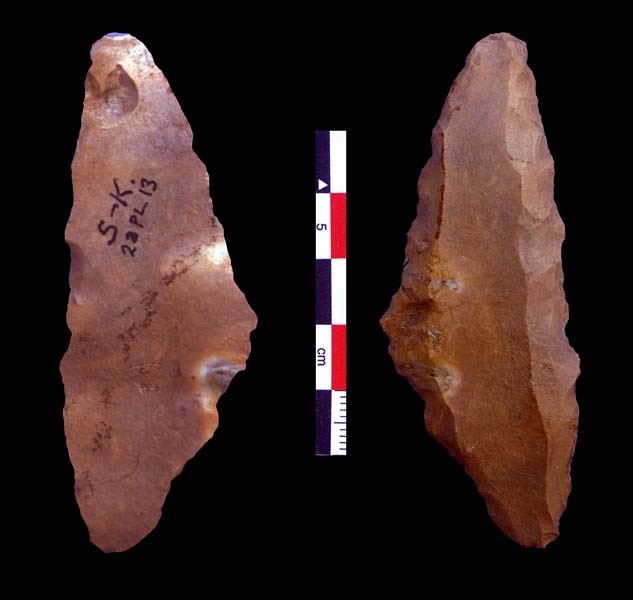 The first published report of the Steed-Kisker site is found in "Archaeological Investigations in Platte and Clay Counties, Missouri" in the United State National Museum Bulletin 183 by Waldo R. Wedel (1943). 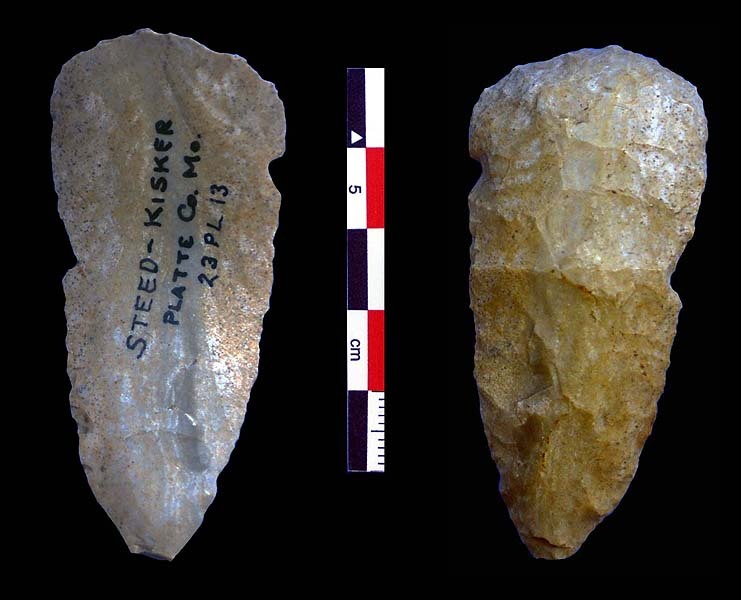 A published description of the Steed Kisker site was written by J. Mett Shippee and published in "Archaeological Remains in the Kansas City Area: the Mississippian Occupation" Missouri Archaeological Society Research Series 9, 1972. 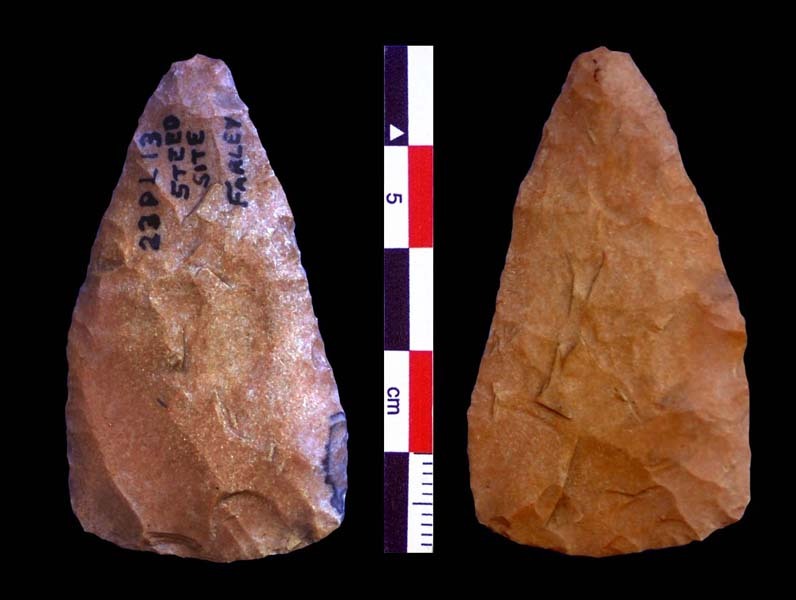 The site is also described in "Steed-Kisker" A Western Missisippian Settlement System" by Patricia J. O'Brien in Mississippian Settlement Patterns (1978), edited by Bruce D. Smith. It is also discussed in "Prehistoric Agriculture in the Central Plains" by Mary J. Adair in the University of Kansas Publications in Anthropology, 16 (1988). 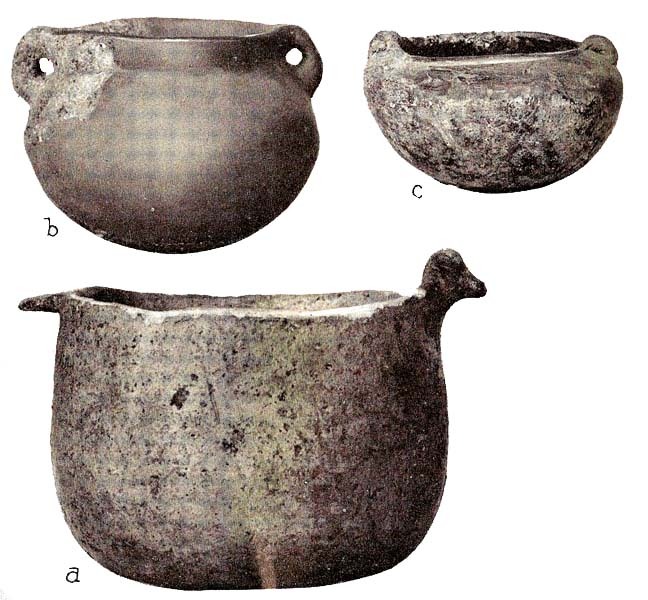 Radiocarbon dates for 23PL13 are reported by Adair based upon work O'Brien's work: AD 860+/-110, AD 1000+/-110, AD 1080+/-80, AD 1110+/-110, AD 1210+/-100, AD 1230+/-100. Special thanks to Laura Ginn for scanning with some of the images from Waldo Wedel's report for inclusion in this webpage as part of her honor's project for Anthropology 101. Many thanks to Sarah Elder, curator of the St. Joseph Museums, for permission to work with the collections from Steed Kisker site.